When I moved to Lexington from New York City, I wondered where my research into Mexican immigrant communities would lead me. Before moving, I had already done some previous research into the local Kentucky immigrant community, and I understood that the terms I used to research in one of New York City’s “Little Mexicos” would change. Two factors immediately stood out to me. Number one, the amount of Spanish speakers and the ease of not speaking English that Mexicans in NYC experience would be drastically different in rural Kentucky. One potential result would be the pressure to learn English at the expense of heritage language development, which I suspected to find at an increasing rate. Number two, the population of Mexican immigrants in Kentucky would be nowhere near to that of the Mexican population in the northeast, and how this also affected some of the larger cultural issues into the macro picture would have to be re-factored. The group identity feature I intend to focus on at this moment is language, but of course immigration, legal status, gender, and social class will also be important. I may perhaps find material to theorize in terms of similarities of motherly roles relating to education in Mexican families–confirming or contrasting with some of the ideas I developed in NYC. I didn’t know what to expect. Leaving the cultural capital of the western hemisphere for the Bluegrass. I had been here before. I lived on Winchester Road for two months back in 2004, during the last major ice storm. I was a member of AmeriCorps National Civilian Community Corps (NCCC), and I volunteered with Habitat for Humanity. My team of 10 Corps members helped build a few houses, and we volunteered at a local children’s hospital, and a few after-school programs and homeless shelters on the northside. Back then I didn’t notice as many Latinos in the city. I remember I met one Mexican at a bar then. He said he saw me and he knew I was Mexican. Well, Chicano at least. He said in broken English there were lots of Mexicans in Lexington. He called the Mexicano barrio Mexington. The pre-paid phone cards “Lex Mex” have a few symbols to unpack. First the text “Ya esta aqui,” you are here! followed by LEX MEX in yellow letters and green, white, and red for the word Mex, utilizing the colors of the Mexican flag. The text and images are overlayed a map of Kentucky. The commonwealth symbol in the lower left corner is the only text in English. To the right of it are eight Latin American national flags: Guatemala, El Salvador, Ecuador, Mexico, Cuba, Honduras, Brazil, and Argentina. As I recall, I saw each of these nations represented at the recent Festival Latino recently held downtown. 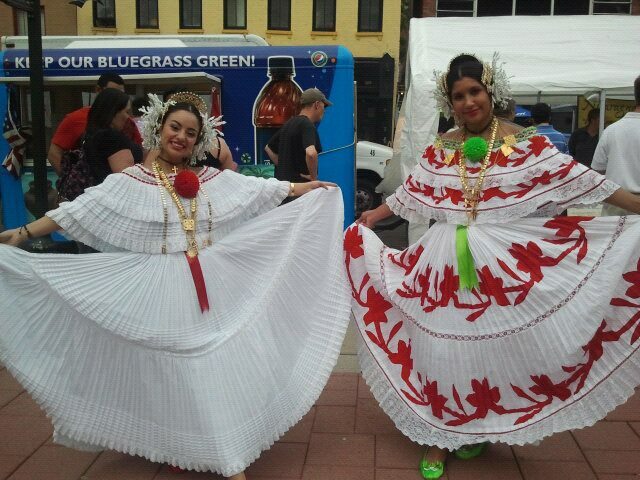 Latinos from all over the state congregated upon Lexington for the weekend celebration. In the mercado for the event, I saw some of these Lex Mex cards for sale. 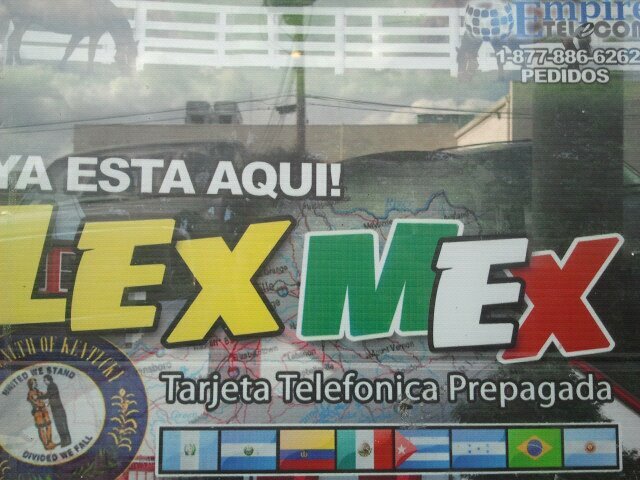 The pre-paid phone cards connect Lexington’s pan-Latino community to the local Lex Mex community of Mexington, where consumers here use pre-paid phone cards to make long distance calls to other countries. The phone card business is big for immigrant communities, as it permits one to make long distance phone calls up front without paying some of the larger fees associated with international calls. Judging by the image, Mexington is more than just Mexicans, but Latinos from multiple nations of Central, South America, and the Caribbean. Nevertheless, the preponderance of Latino folks I’ve met thus far have been Mexican or Mexican American. I already knew a bit about the local Mexican community because of my previous research, conducted via readings about local migration patterns both during my job search, and also just before I arrived to Lexington. I saw some commonalities with NYC’s Mexican population. Like in NYC, the Mexican population of Kentucky was a relatively new one. Also like NYC, the local schools had a growing demographic of students with Mexican backgrounds. I suspected that the growing demographic would prove to be especially difficult for Kentucky schools because of the longer history of Latin American migrant of NYC–ever since its Cuban and Puerto Rican immigrants from the turn and early twentieth centuries. This longer history established community and academic networks that established pattern of Spanish already settled into the community’s local identity eased some of the transition for immigrant families in NYC. Of course there were still problems, but the initial framework also meant not starting from scratch. The transition to a smaller community of Spanish speakers in Kentucky meant that much of the daily business of living in the community would be conducted in English. In NYC the Mexican community, like in Kentucky, increased dramatically since the mid-90s. In other words, both were not “traditional” hubs of Mexican migration in the United States. Both were becoming increasingly aware, however, of the growing presence. NYC’s Mexican population hovers near 400,000. Lexington’s is closer to 20,000. In general, NYC’s population is around 8 million. Lexington’s is 250,000. Upon arrival, just over two months now, I have met a few insiders in the local Mexican community, ranging from journalists, to activists, to teachers, and to students from kindergarten to college. My best bet to approach the local Mexican community as an outsider was to become an insider–through volunteer work. Though I am Mexican American, I was new to the community, and I had to get to know the differences of Chicano perceptions the local immigrant community had. Mexican American is the ethnic group to which I claim membership, and though there are Mexican Americans in Kentucky, I hail from a different region, the Arizona borderlands. My Chicano experience would be different from the locals, so I didn’t want to make any presumptions using my ethnicity to establish rapport. As I argued in my research in New York, building confianza, or trust, happens with community involvement and participating in the activities of the community, especially when researching with families. Finding these commanalities is in intellectual project into audience identification, and shapes of social interactions. Confianza likewise is in intellectual construct, however, differs from confianza between individuals. On the one hand, the research form presented in my ethnography only reaches individuals approaching my scholarship, which mediates the human experience of building confianza in a study. In order to gain this social connection, I’ve had to remove myself from my academic “ivory tower” and actively find space to participate in a community largely forgotten by the institutional nexus of power the university had historically established. As an ethnographer, I’m well aware that participating with the community under study necessitates a study of self, and one’s position of researcher and possibilities of approaching a community’s daily routines without obstructing them. Genzuk argues that the ethnographer must learn to mesh community observations and participation so as to describe the community for outsiders, while learning to understand the community as an insider. The ethnographer, thus, mediates between audiences, s/he brokers representations with reality, subjective experiences with ethical responsibility to be “objective.” To this I add the add the importance of building confianza both with the community so as to gain the insider perspective, but also with one’s readership or audience. Through my fieldwork at NYC, I learned that participation happened during fieldwork, and when I distanced myself to write my study, my observations had increased importance. My voice as participant was not predicated on objectivity, but rather in giving the details of my interactions in the mentoring program and the lives I learned about. Ethos need not mean objectivity. The credibility of my voice and the voices of those I represent social interactions and intersubjectivity. My ethos as fieldworker happens first when I give my history of research, as well as the extended amount of time I will have spent with local Mexican immigrant community of focus, and how my subjectivity as researcher interacts with theirs as we build a sense of trust. Moving to Kentucky, I was not sure what to expect in terms of patterns that have culturally affected local immigrants, especially linguistically and with regards to schooling. I arrived to Lexington looking to find programs like I left in NYC. The Mexican American Network of Students (MANOS) connected English language mentors with elementary and middle school students and their parents to complete homework and to offer educational advice. MANOS operated on a number of fronts: as homework assistance; as educational counseling; as pedagogical workshop; as family advising; community building; and community-building enterprise. MANOS integrated learning from multiple angles, through English language programs for parents, homework assistance, early education, and immigration and education forums. I didn’t expect to find anything as extensive as MANOS in Kentucky. The image above is a mural painted by students at the program, and led by a professional muralist commissioned to complete the project. 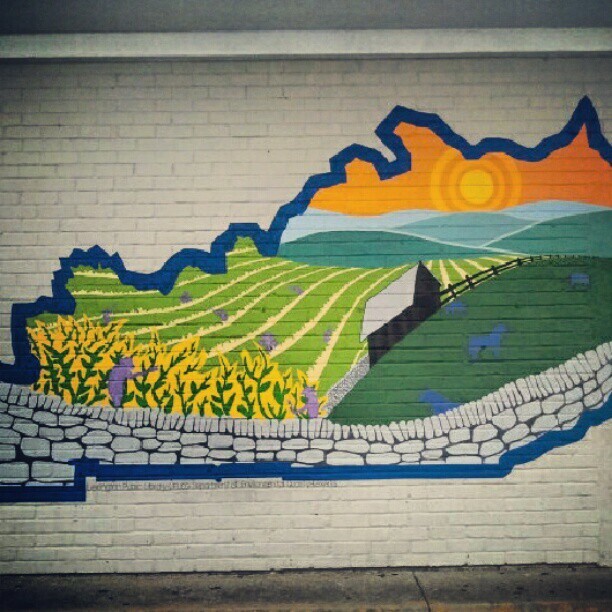 The outline of the state of Kentucky reflects the local landscape. There are subtle references to migration or the immigrants whose work goes into producing such a landscape with the purple figures down the line of plants in the field. Workers are not absent from the portrayal. There are references to the horsing and farming industries with the images of the farm and fenced-in animals. I wondered what the folks at MANOS would have painted with the public space. I had to stop myself there, remembering MANOS met in a church basement, and that I was approaching a public building. MANOS ran on volunteer work and a donation of space. This library ran from federal, state, and private grants. This caused me to reflect on how despite the smaller population, Lexington had a more embracing attitude toward Mexington. I have volunteered for four hours every week at the Mexington Library tutoring program, another two hours every week at a public elementary school in a different part of town, and two hours a month at a local high school. At the high school I have been conducting a writing workshop with Mexican and Latino students. My informants will come from these connections I’m developing with Mexican/Mexican American folks in these communities, and I expect to have a sample of interviews from students of all ages. The library, because of the majority of my fieldwork hours will be conducted there, will be where I find the majority of my informants and where I will conduct most of my observations. This semester I’m only volunteering a couple nights, as I’m also doing volunteer fieldwork in other parts of the city as well. I foresee my research next semester to focus on the Mexington Library. Because I’m a volunteer, becoming involved was relatively easy, aside from negotiating my schedule. The library operates four days a week, four hours each day. Out of the sixteen possible hours, I volunteer four, and at the beginning of the week. In terms of who the additional volunteers are and their schedules, my information is limited. This will cause a central bias, that is, not having a fuller gaze into the program’s operations outside the hours I volunteer. This will be something for me to consider for future research. The organizers of the program are the public library. The staff there are bilingual, and I hear them use Spanish, English, and Spanglish to communicate with parents and children. They are mediators, or brokers, between the languages, as well as authorities in coordinating the program and its participants. I’ll be interviewing two of these organizers to hear their opinions on their jobs, and their outreach into the local community. I research will explore further these connections between languages with families and the after-school program, to understand the modes of communication and the reinforcement of schooling in both communicating to parents and their children expectations. At the same time, I hope to provide research for the program, with the aim of finding connections between parents and English language tutors, for supervision and interaction in homework tutoring. I will examine how parental observation and participation will affect the English language tutoring of their children. In terms of family members, children to parents, exclusively in Spanish. I’m not hearing Poblano (Spanish from Puebla) as I hear different accents, from different parts of Mexico. Michoacan, San Luis Potosi, Chiapas, Guerrero, and Sinaloa. Between children and English language mentors, English. Between children, Spanglish. I’ve used Spanglish with children, and this has built some curiosity with their homework and the language mentoring I seek to offer. These young women proudly displayed the traditional dress of Panama. I thanked them for their pose. They continued to walk around the 2012 Lexington Latino Festival posing with anyone who requested a photo. The young women were local high school students and also folklorico performers. While they walked around the festival, they switched between Spanish, English, and Spanglish and they communicated with each person who took photos of them, whether with a camera or a cell phone. They were brokers, and possibly visual mentors for two reasons: one, they represented the growing Latino demographic in the area, and two because con ganas they represented their heritages and identities as Latino Blue Grass. Alvarez, Steven. “Dresses/Vestidas.” Photograph. 14 Sept. 2012. —. “Kentucky.” Photograph. 25 July 2012. —. “LexMex.” Photograph. 25 July 2012. Genzuk, Michael. “A Synthesis of Ethnographic Research.” Los Angeles, CA: Center of Multilingual, Multicultural Research 1999. Web. 22 Sept. 2012. Van Maanen, John. “Ethnography as Work: Some Rules of Engagement.” Journal of Management Studies 48.1 (2011): 218-234. Print.